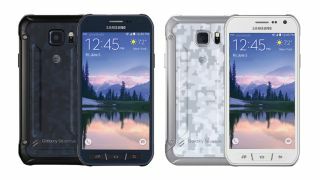 Yesterday we got what appeared to be our first look at the Samsung Galaxy S6 Active and today there's another leaked batch of images to pour over and these new snaps are much sharper and appear to be official press renderings. With the Galaxy S6 notably dropping its dust and waterproof IP67 rating, the upcoming Active variant is a better choice for those who want their mobile to be able to stand up to the great outdoors. The pics are courtesy of well-known tipster @evleaks so we can be pretty sure of their authenticity. There's a white and a black version to pick from, both with a camouflage pattern on the back. This pair of handsets certainly look a lot more rugged than the svelte Galaxy S6 and Galaxy S6 Edge, so we'd expect some serious water, dust and shockproofing on these models, while the specs are rumoured to be broadly in line with Samsung's current flagships. We've also heard they'll pack a bigger battery than their forerunners - for all those outdoor pursuit events - as well as a microSD slot for helping you capture tons of photos and video clips on your travels. Much as we love the original S6 handsets, it's nice to see Samsung putting out something that's distinctively different. As for when we'll get official confirmation about the device, it should be out before the end of the year.